The weather in Nebraska has slowly transitioned from wet (very wet for some) and relatively cool to dry and warm. May ended up being cooler (1-3°F ) and wetter (0-3 inches) than normal (Figure 1). 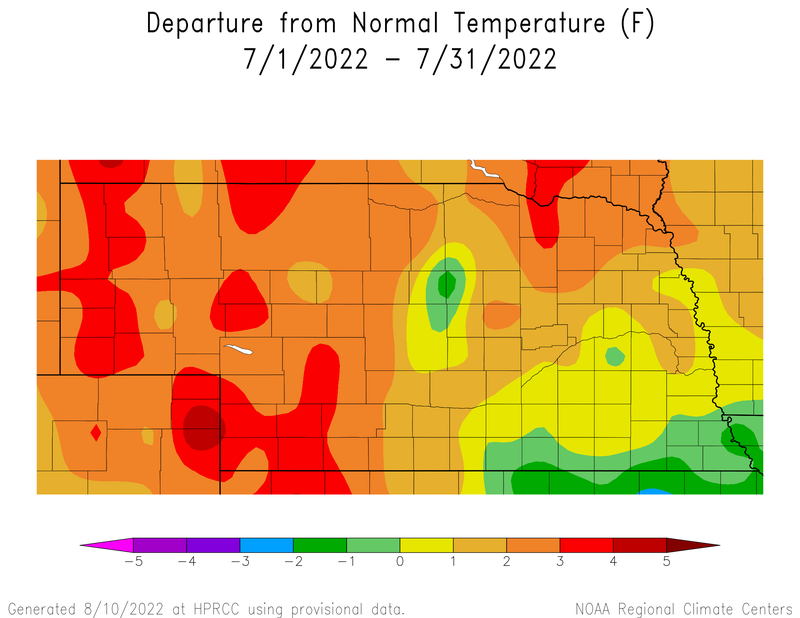 Portions of the Panhandle ended up with below normal precipitation and northeast Nebraska was slightly warmer than normal, but overall, it was cool and wet. Then June arrived. The first week of the month was dry for almost everyone except a small area in the east central part of the state. We have also ramped up the temperatures and we have been steadily in the 90s for a few days. This will rapidly dry out the surface, especially for fields, gardens, etc. that do not have any residue cover. Residue will keep some of that moisture in your soil and will moderate soil temperatures. Those with surface residue will be thankful they have it this week. With temperatures rising for the first time this season, it is always good to touch on some information to help protect livestock. The heat stress on livestock, and specifically cattle, is a combination of both heat and humidity. Handling cattle early in the mornings before temperatures get too high is always recommended and is a good practice during the summer months. The animal’s core temperature peaks approximately two hours after the environmental temperature peaks and takes four to six hours to lower back to normal temperature. Consider shade for the animals, working smaller groups at a time, adequate air flow, and minimizing stress on the animal to reduce losses due to heat stress. The USDA-ARS provides a livestock heat stress map (Figure 2) to help plan for these events. 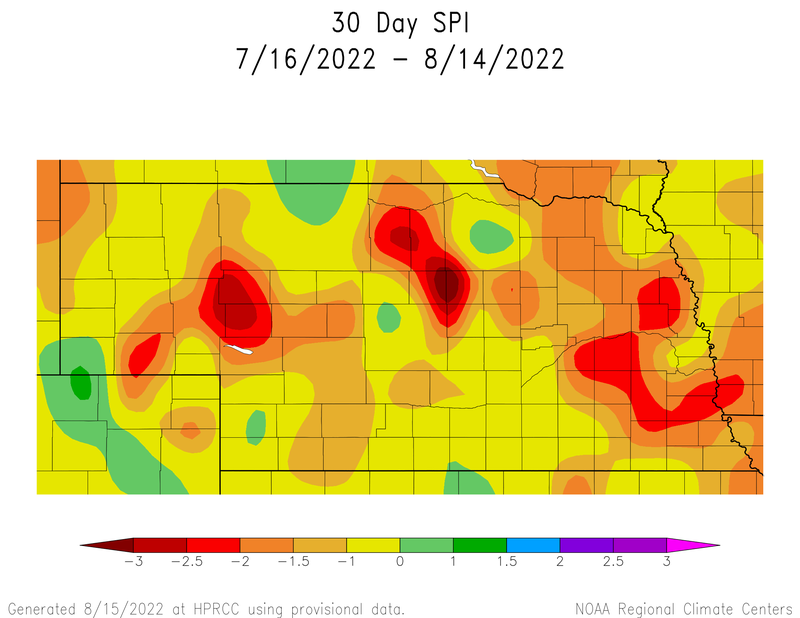 The heat will have an impact on water resources, but the current state of soil moisture and stream flows in Nebraska should limit any severe impact from the upcoming heat wave. Many rivers are at, near or above capacity in the state and the 60-day Standardized Precipitation Index (SPI) is not showing negative values at this time. The 30-day SPI is showing some negative values in the Panhandle, but that area is small, for now. We should remain drought free for a while with the potential for the “Abnormally Dry” category to move into NW Nebraska in the coming weeks. The forecast headline is no doubt the warm temperatures. We have heard about this for sometime and it is finally here. The high temperatures and mostly dry and windy conditions will remain for most of Nebraska through the weekend. There is a strong ridge over the middle of the country and that is allowing much above normal temperatures to settle in from Texas to Canada. Then Sunday night and Monday rolls around and things get interesting. A week trough will move through Nebraska Sunday night and bring chances of precipitation. With high dewpoints, the precipitation could be heavy, but probably not widespread. The bigger system moves through Monday and Tuesday, which will bring in more chances for precipitation. Currently, the models have this system as a cut-off low over the central plains, which could create some unusual weather for us. I think the potential for severe weather, heavy rain, and the chance of totally missing out on any precipitation are all viable options at this point. Right now the target for the highest precipitation amounts (and strong storms) is for the central part of the state on Monday and Tuesday. Either way, precipitation does look likely for a large portion of the state, but we won’t know much about the location or amounts until after the event. The timing of the exit of the mid-week system will determine the weather for the rest of next week. 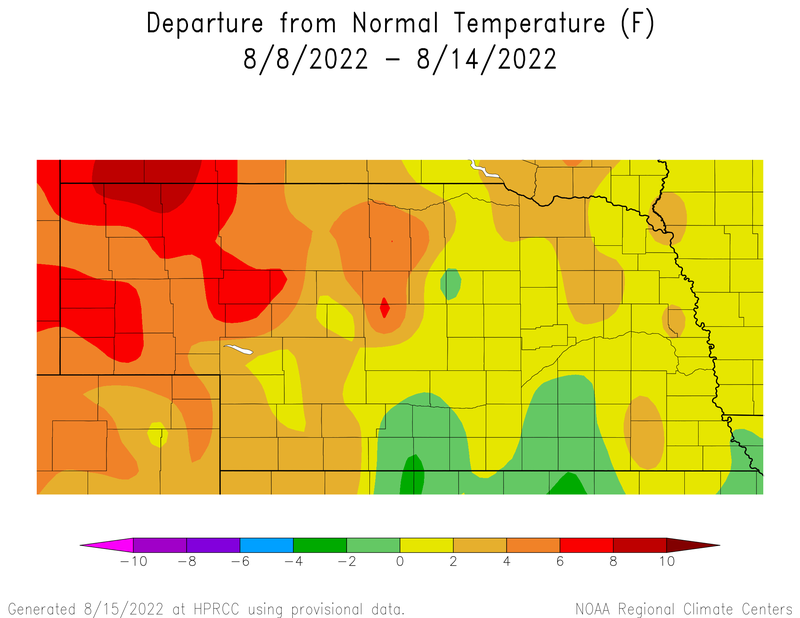 Models are showing a fairly quick return to a warm and dry weather pattern, however, that cut-off low could linger around longer than expected, especially in eastern Nebraska, and could keep some clouds around and moderate high temperatures. The 8-14 Day (June 18-24) Outlook from the Climate Prediction Center (Figure) is showing increased chances for above normal temperatures and below normal precipitation for most of the Plains and Midwest. 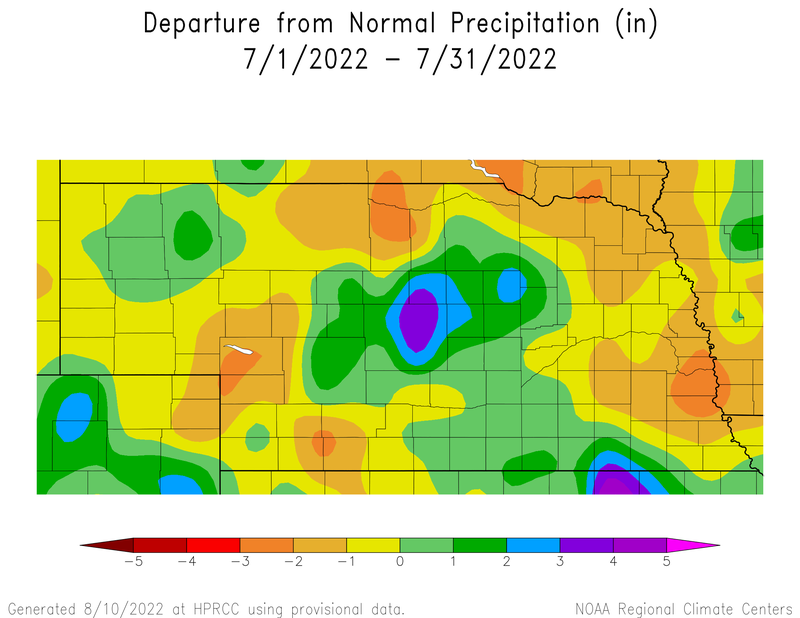 We will see what sort of precipitation we receive out of this next system, but another couple weeks of warm and dry weather could create some surface drying issues, especially in western Nebraska. My hunch is that temperatures may be above normal, but shouldn’t be as extreme as what we will experience this weekend. The models are not as amplified and should hopefully moderate the very high temperatures and decrease overall wind speeds. ​Looking out long-term, I truly don’t have a handle on the next 30-45 days. 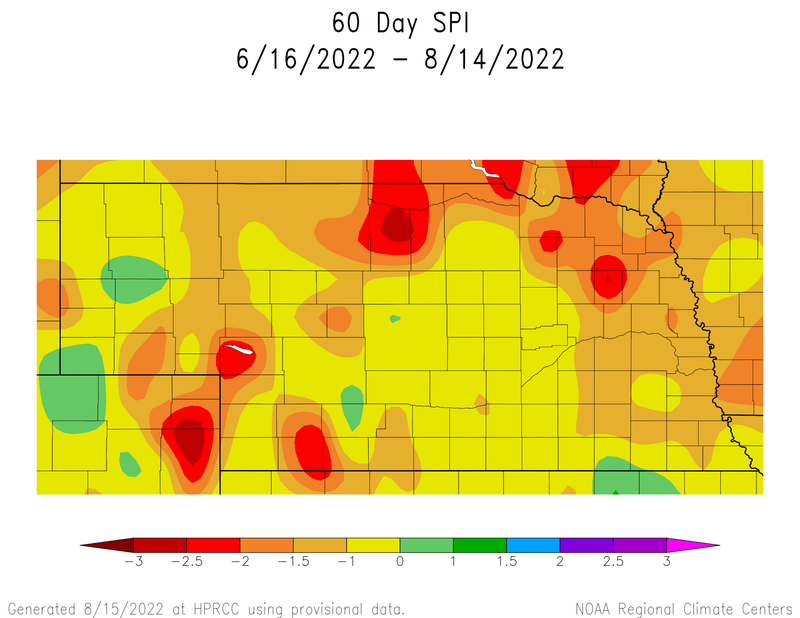 With La Nina making it’s arrival later this summer or early fall, we may see the long-term outlooks start to pickup on typical La Nina conditions, which could bring warm and dry weather to the Midwest. The current June and June through August Outlooks from the CPC (Figure) show enhanced chances for below normal temperatures for us in June and above normal precipitation for June through August. Again, these maps are based on a probability of conditions compared to normal and I think will change quite a bit as they are updated next week. Be looking for a response to that release next week.